Fishtoft (blue), Coningsby (red) football action. John McGarel (blue), Shaun Boothby (red). Sharman Burgess Sports Cup, quarter-final (KO 2pm): Skegness Town Res v Benington (R. Crozier). Sharman Burgess Sports Cup, semi-final: Old Leake v Leverton SFC (P. Hindle). BB Insure Willoughby Cup, quarter-finals: Friskney v Swineshead Inst (M. Webster). BB Insure Willoughby Cup, semi-final: Old Dons v Spilsby Town (D. Tunnicliffe). 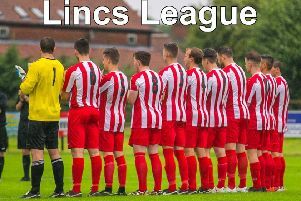 Taylors Garages Premier Division (KO 2.30pm): Billinghay Ath v Heckington Millers (P. Keeble), Kirton Town v Ruskington Rvrs (D.Sharples), Pointon v Coningsby (T. Sharrock), Wyberton Res v Fishtoft (P. Revell). Taylors Peugeot Division One: Swineshead Res v Freiston (R. Shortland), Woodhall Spa Utd v FC Wrangle (R. Walter). Taylors Ford Division Two: Coningsby Res v Railway Ath (L. Crawford), Fishtoft Res v Pointon Res (C. Armond), Mareham Utd v Park Utd (T. Baron), Sibsey v FC Kirton (S. Beaumont), Swineshead A v Holbeach Bank (R. Wilde). Taylors Vauxhall Division Three: Spilsby Res v Spalding Harriers (S. Wood).